Chinese kung-fu sportsman is training in the park, late night. A caucasian (looks like as Owen Wilson to me, but I am not sure), is watching him and impressed by his skills asks him to teach him kung-fu. After many rejections he finally agree to teach him. At the beach chinese man ask him to jump from the hole in the sand without bending the knees. Another day they are running on the beach, and Owen(?) thinks that he is better without knowing that chinese man is wearing weights on his legs. After few days chinese man takes Owen(?) into his apartment and show him a puppet with all acupunctural dots marked on it. He started to explain Owen(?) what is their purpose but he doesn't believe. So, chinese man punch him few times at his spine and Owen(?) can't make any move after that. With another combination of punches he release him and after that he made Owen(?) to start laughing without control. How old is the movie? It is in english, right? Yes, it is in English, but I don't how old it is. Maybe15-20 years? 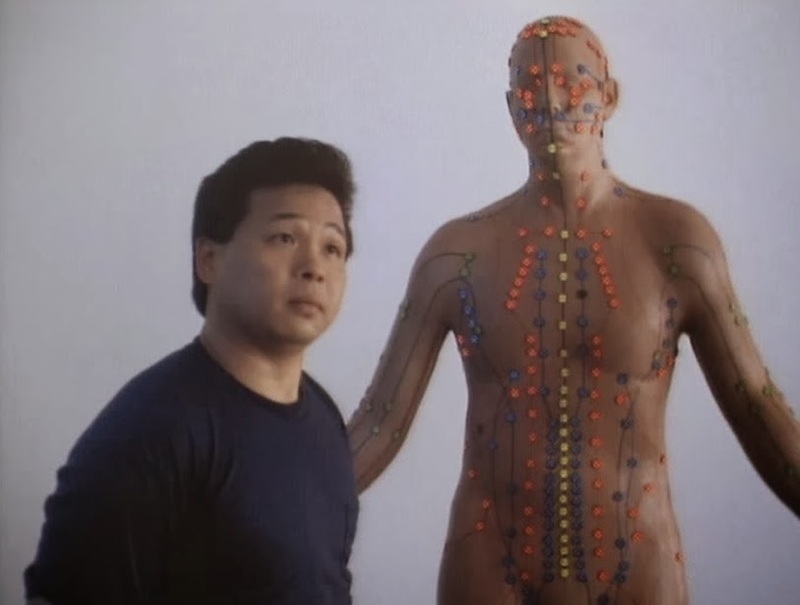 im pretty sure it is "Remo Williams: the adventure begins"
Hi, could this be the guy and the acupuncture dummy? Cool. That is a scene from "College Kickboxers". I realized why that movie might not look right to you from the other description, when I read that it was an internal plot piece that does differ from the main box description. Yes, this is the movie. Thank you very much.